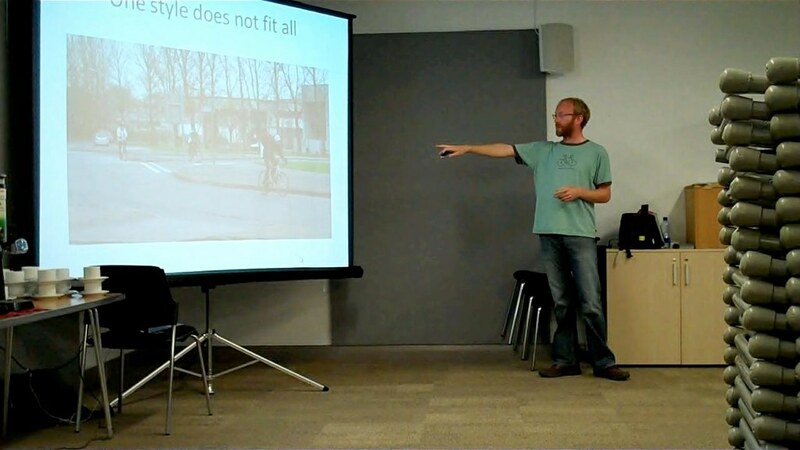 We offer informed, expert advice and commentary on issues affecting cycling to news media and other interested parties. 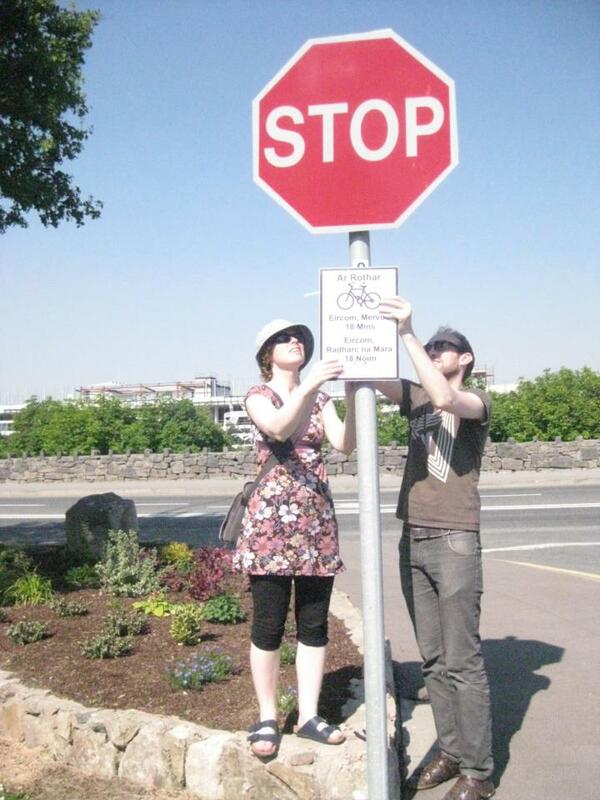 We put up hundreds of signs around Galway city and county showing commuting times by bicycle. 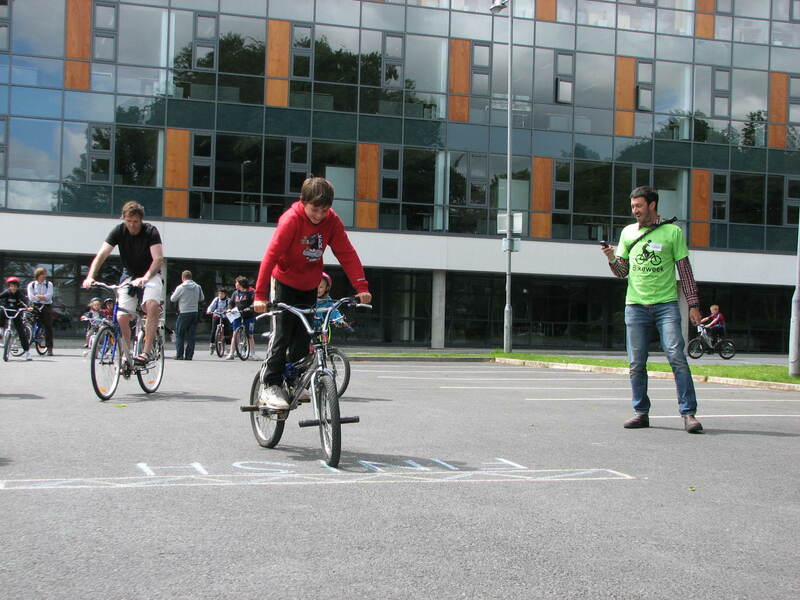 The aim was to show commuters how quickly one can get around Galway by bike. We created Cycling Skills leaflets and distributed thousands of them in Ireland, both north and south of the border. They educate road users on how to share the road and deal with common traffic situations safely, skilfully and confidently. The leaflets have been adapted (with permission) for use elsewhere in Ireland. During Bike Week, we have organised treasure hunts by bike in Dangan and in Renmore, with prizes for participants including new bicycles and lots of accessories. The treasure hunts proved hugely popular with families in Galway. 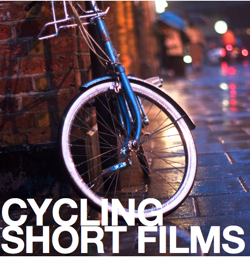 Again for Bike Week, we curated sessions of short film nights with a cycling theme, screened in various venues in Galway. 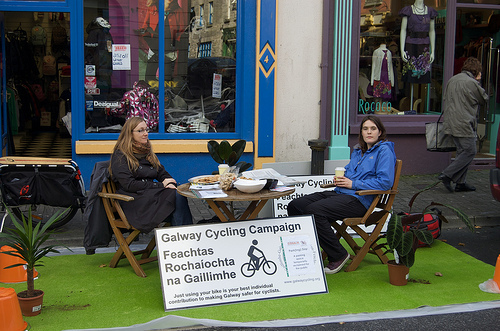 The aim of Park(ing) Day is to convert one car-parking space into a miniature public park for a day, in an area of Galway underserved by public open space. People stop by for a chat and are inspired to imagine different ways cities can be designed. 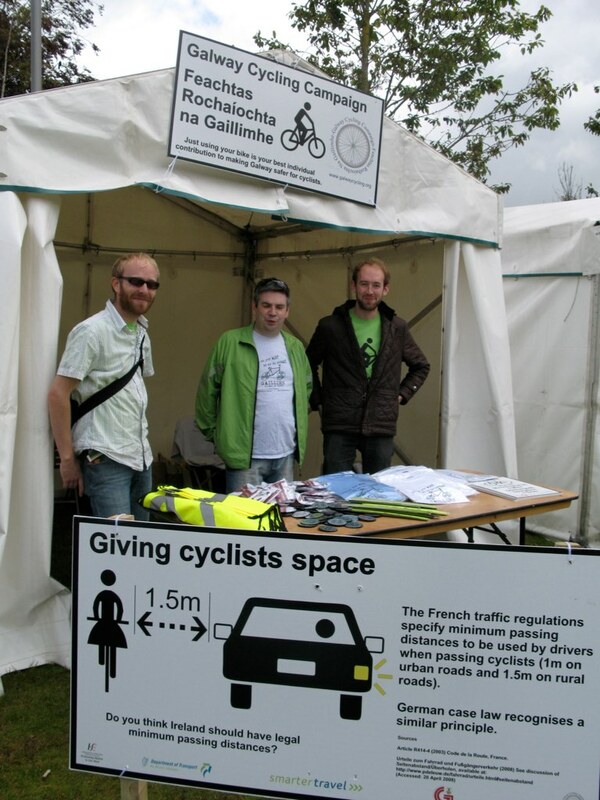 Galway Cycling Campaign was the first organisation to introduce this idea to Ireland. 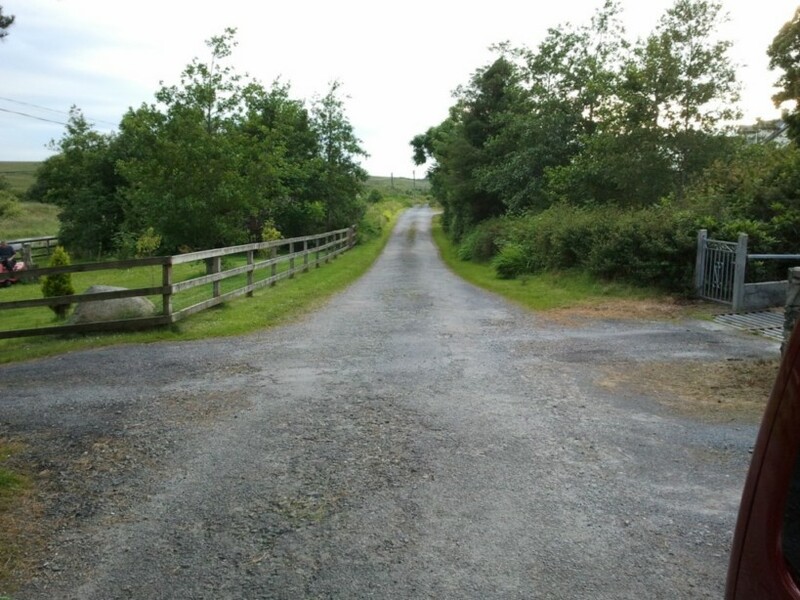 In 2012, we were involved in a Bord Pleanála (National Planning Board) oral hearing into a proposed section of the Connemara Greenway between the towns of Oughterard and Clifden in Co Galway. 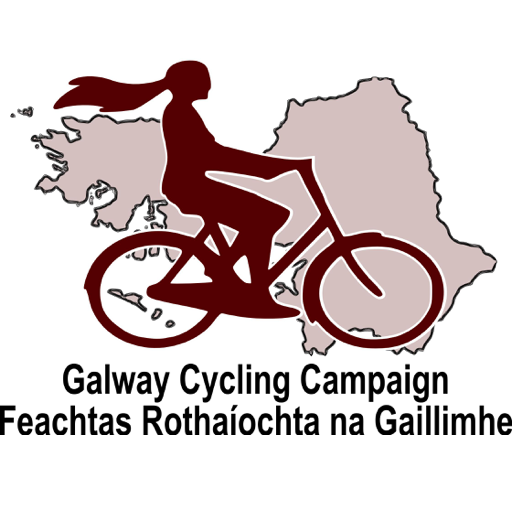 Galway County Council originally wanted to put a continuous 11km section of tourist cycle route directly beside high-speed (100km/h) traffic with no physical barriers. At the oral hearing we highlighted flaws with the proposals and pointed out alternatives using a disused railway alignment, minor low traffic roads and sections of abandoned road. The County Council conceded an additional 6km of off-road route during the proceedings. Tribes on Bikes is a brand which promotes cycling in Galway. It includes a website, a calendar with <u>top-class photography</u>, and accessories like saddle covers. Above is a sample of the work we do and events we organise.